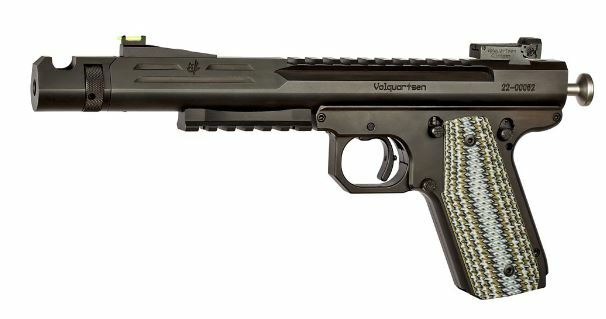 The Scorpion chambered in 22 WMR is the next progression for Volquartsen's Scorpion line of pistols. The Scorpion 22 LR has proven itself in regard to performance in both accuracy and reliability but for certain applications shooters are looking for a little more in the way of ballistics than what can be found in 22 LR. The 22 WMR provides increased muzzle velocity, more energy but maintains the same level of performance you�ve come to expect from a Volquartsen Scorpion. This gun is a new breed of hunting pistol for small game and varmint. Pistol comes with Hi-Viz Front and Target Rear Sights, VZ Grips. Compensator is optional. Finish is either Black Nitride or Hard Chrome. Note: Volquartsen has decided to no longer offer Scorpions in the Hard Chrome finish so what we have is it.